We moved here in 2001 just in time to experience the massive forest fires of 2003. About 400 trees on our property, mainly pines, but also Arbutus and olives, were destroyed. The olives and Arbutus regrew (very quickly – initially at 1m/year) but there were large blank spaces so we set about large scale (2.8Ha) tree planting. The big question was what to plant? “Indigenous” trees include sobreiro (Quercus suber), oliveira (Olea europea) and medronhoeira (Arbutus unedo). All make a slow start and take quite a long time to resemble proper trees. In 2003 I was 66 years old and wasn´t prepared to wait till I was 100 to see woodland replaced. The southernmost province of Portugal, the Algarve, is, according to the USDA designation, classified as zone 9/10. Because we have a garden 500m up in the sky we regard ourselves as 9ish but, like all gardens, nothing is uniform so we have bits of 10 and bits of 8 as well. All of the garden has acid soil on granite/syenite rock; there is a dearth of N and P and lashings of K. Rainfall is seasonal falling from October to May – about 800-1000mm p.a. My experience of tree planting was limited to temperate Europe, N America and the tropics. The Mediterranean climate is something quite different and my gardening philosophy wasn´t quite up to scratch. This story can go on forever but the focus here is how I came to realize that we were selecting a lot of Australasian plants without, at the time, being aware of the fact. I thought it might be of interest to hear how some of our choices have performed and equally important how they appear in relation to the surrounding flora. Also, how they have filled those blank spaces following the fires. 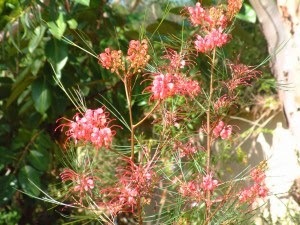 The most successful choice was Grevillea robusta. Young plants about 80cm high were bought in from local nurseries. Many were placed in windy locations and had to be staked. They were watered weekly during their first two summers and soon began their amazing growth. Five years after planting they have reached 5m or more with a trunk circumference of 60cm. Most of them ignore the wind and are upright and symmetrical. Their leaf colour and shape is different from everything else here but the underside of the leaf matches almost perfectly the silvery grey of the adjacent olives. It is evergreen here although our trees have not yet flowered. The next best choice was Melia azedarach. I´m not sure whether you count this as truly Australian since it is also found in SW Asia, China and Japan. For us its growth is phenomenal: 4.5m in five years. The blossom is scented and colourful; the orange berries that overwinter make a superb contrast with our deep blue skies. The tree is deciduous but as a summer shade giver it has been a boon. 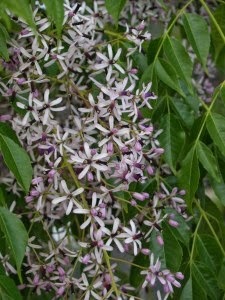 They are widely used as street trees and seem to belong on our property. You will probably expect me to eulogise the Eucalypts. It is unfortunate that many hectares of Portugal, particularly here in the south, are heavily planted with Eucalyptus globulus. The attraction of rapid growth, harvesting every 7-10 years with multi-stemmed regrowth has made them very popular as a cash crop. They compete with native flora (and, as a knock-on, native fauna) to the detriment of the latter; they also burn vigorously when the arsonists get busy. Acacias grow here freely. Acacia dealbata is regarded as an undesirable invader and is on the list of Invasive Plants which it is illiegal to sell and which the Forestry Dept. attacks from time to time. Equally unwanted are A. longifolia and A. saligna, both of which we have. 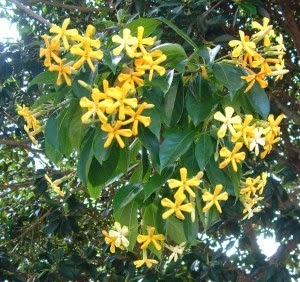 They grow very fast, flower freely and beautifully and snap (trunk and main branches) in even modest wind. They make good firewood. Since Acacias are widespread they almost appear as if they belong. We have both Brachychiton acerifolius and B. populneus. The latter flourishes and those that I started from seed have reached 2-3m in four years. B. acerifolius, bought in at 1.5m, have grown little and do not look happy although they are in similar soil and position to the B.populneus. We have a single specimen of Hymenosporum flavum. It was donated as a 60cm potted sapling and, without any attention apart from some limited summer watering, has grown and grown, like a bean pole. It now stands at about 5m with little branching although it has flowered for the past two years - patently a foreigner. The several Callistemons (C.rigidus) that we planted early on have not proved very spectacular. Following the pruning advice from the Australasian Plant Society newsletter, the plants are now tidier and flowering has improved but we have not achieved photograph-worthiness yet. Meterosideros excelsus, by contrast, is now a large expanding bush which needed 4 years before it would flower (we live about 16Km from the sea). But it has made up for the wait by sheer volume of colour. Following the big fire we needed wind breaks all over the place and were directed to Myoporum laetum. Although planned as hedge plants they are now turning into trees and withstand drought and wind. A few have been heavily pruned with no ill consequences. The flowers are small but pretty and the sheer mass of evergreen foliage has been of great value. The Greens don´t like Myoporum and would like to see it banned but for us it fits in well. Grevillea rosmarinifolia : 3 x 3m and still growing. Spectacular flower colour and form. Leptospermum scoparium: easily pruned to produce a tidy mass of colour throughout the winter. Melaleuca ericifolia: the only sp. available here. Fairly rapid growth and useful as a wind break but becomes ungainly with age. Dodonea viscosa ´Purpurem`: seem to need shelter in our windy location but good leaf colour. Westringia fructicosa: disappointing. We are sticking with Rosmarinus officinalis. Hardenbergia violacea: vigorous growth, easy to start from cuttings, and a truly overwhelming sight in full flower. Pandorea pandorana: who strangles who first? I have had to take the trimmer up on top of the pergola to reduce the incredible mass of material. Beautiful pink flowers in the early winter. Alyogyne hueglii: exquisite flowers but each of my plants dies after two years. Very modest watering in the dry months hasn´t helped although the roots are well developed and extend over 1m from the stem. Coprosma repens `Coppershine` x kirki all used as ground cover. Not spectacular but useful and reliable. We have several other Australasian origin plants among our Californian, S. African and S. American acquisitions. The range of sub-tropical plants that will grow here and are often well adapted to this environment is enormous. The principal limitation is source of material since we are not endowed with much by way of nurseries. Growing from seed is fun but takes time and, quite often, expertise of which I don´t seem to have enough. Overall, the southern hemisphere has provided many replacements and our Aussie plantings have become established amongst their European neighbours.